In short, conclude the authors, “post-acute facilities have fewer referral sources than in the past, meaning that maintaining strong relationships with each one is critical” — before going on to explain precisely how that can be done via contact-free continuous monitoring (CFCM) technology. The key for a post-acute care network to preserve important relationships with referring hospitals lies in its ability to treat more high-acuity patients, argue the white paper authors — and this can be done with the implementation of contact-free continuous monitoring in just a fraction of its patient beds. Bundled payments are also having an impact on hospital referrals, the authors note. Even though most post-acute care networks are not directly included in the bundled payments model, the hospitals that refer patients to them increasingly are. 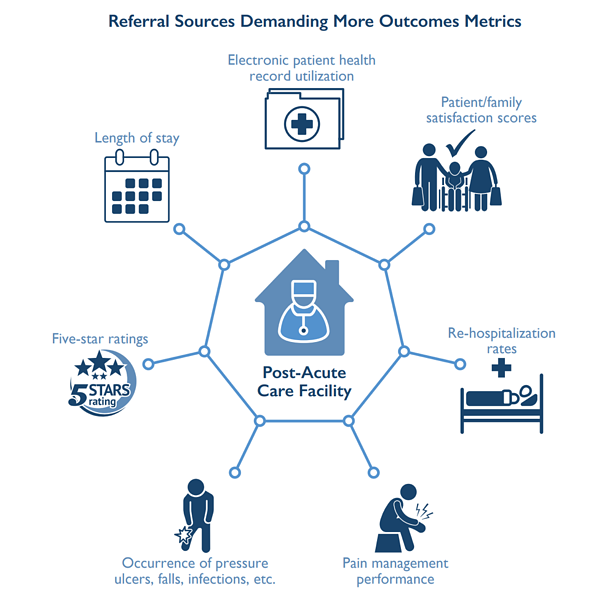 Therefore, administrators at hospitals and health networks are more closely scrutinizing the performance of the post-acute care facilities in their referral networks. Contact-free continuous monitoring can help facilities meet this heightened level of scrutiny, particularly skilled nursing facilities, which “are likely never going to be state of the art,” as another administrator told the white paper authors. “CFCM gives SNFs the ability to go to a hospital with very reliable data to show your improvement in readmission rates and share data with that hospital,” he adds. Failure to improve and document performance “can put post-acute facilities lower on the referral list that hospitals share with patient families during discharge planning,” the authors note. On the other hand, facilities “can expect to see an increase in the number of their patients reimbursed under bundled payments, especially those with heart failure or who recently underwent joint replacement and spinal surgery,” and can prosper by configuring just a fraction of its number of beds to treat these higher-acuity patients. This expanded capacity to treat higher-acuity patients not only enhances a post-acute care network’s potential to retain — and increase — hospital referrals, but it can also serve as a powerful tool in boosting a facility’s bottom line in a particularly competitive market, the authors note. That last point is, of course, key to “helping the facility retain reimbursement that it would have lost otherwise” — as well as landing new hospital referral partners. “Referring hospitals and physicians will drive their complex patients to the facility since its adoption of CFCM demonstrates it is best in class,” they add. Learn more about how contact-free continuous monitoring can help your post-acute or skilled nursing facility preserve and increase hospital referrals: Download the complimentary white paper here, or contact us here to schedule a consultation with an EarlySense expert.